In a recent e-publication in the Journal of Health Communication, Mary Buller, President of Klein Buendel, and her coauthors report results of an evaluation of using Real Health Photos in health communication messaging. Real Health Photos is a unique collection of images of people with diversity of age, gender, race, ethnicity, income level, and health condition. The collection was produced by Klein Buendel to portray the diversity of health through photography and promote the inclusion of all populations in health promotion materials and media. Of particular concern is how to reach underserved populations with effective health messages. Underserved groups with particular health needs — including people with disabilities, the elderly, and the overweight or obese — are underrepresented in popular media images and are often stigmatized so that they have to deal with prejudice and ostracization. This research project tested the prediction that photographs depicting people very similar to the target population of a health message would improve the health communication and increase the target populations’ intentions to change behavior in a favorable, more healthful direction. The evaluation of using Real Health Photos in health communication messaging was guided by the homophily principle. The homophily principle — that perceived similarities among people produce positive reactions — is a cross-cultural, global phenomenon and is grounded in the power of identification. Specifically, the study tested two hypotheses: (1) whether a health communication message will be more effective (that is, create stronger behavioral intentions to increase physical activity and eat a healthy diet) when incorporating photographs that match the target population than photographs that do not match the population in disability, age, or weight; and (2) whether the effectiveness of photographs that match the population on disability, age, or weight will be mediated by identification with persons in the photographs (that is, matched photographs will increase identification relative to unmatched photographs and increased identification will be associated with greater behavioral intentions). To test the hypotheses, three nationally-representative samples of adults (n=1,796) who were physically-disabled, elderly, or overweight/obese were selected from a large national survey panel. Participants read an identical message promoting increased moderate to vigorous physical activity and decreased intake of high fat, high sugar, and high carbohydrate foods. Photographs from a commercial stock photograph service versus photographs created for the research project to match the three populations — from Real Health Photos — were included in the messages. Participants responded to assessments of behavioral intentions, outcome and self-efficacy expectations, and identification. Statistical analysis confirmed that Real Health Photos that matched the specific target population increased behavioral intentions mediated by identification in the physically-disabled and overweight/obese samples. Matched visual images improved health message effectiveness by capitalizing on the homophily and identification processes. The development of Real Health Photos and this research were funded by a Small Business Innovation Research grant from the National Institute of Minority Health and Health Disparities (MD003338; Mary Buller, Principal Investigator). 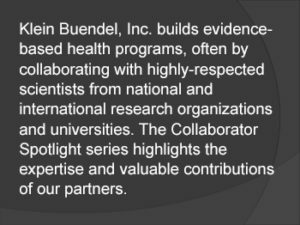 Coauthors include Dr. Peter Andersen from San Diego State University, Dr. Michael Slater from The Ohio State University, Dr. Kim Henry from Colorado State University, Lyndsay Fluharty from Telligen, Inc., and Dr. Erwin Bettinghaus, Xia (Lucia) Liu, Steven Fullmer, and Dr. David Buller from Klein Buendel. Many of the Real Health Photos used in this study were taken by Delia Palmisano from Blue House Photography in Denver, Colorado. Dr. Gregory Zimet is a Clinical Psychologist and Professor in the Department of Pediatrics at the Indiana University School of Medicine. Since he arrived there in 1993, he has guided an extensive, multi-faceted research program focused on attitudes about, and acceptance of, vaccines for the prevention of sexually-transmitted infections, including the human papillomavirus (HPV) vaccine. Currently, Dr. Zimet serves as a KB collaborating scientist with Dr. Gill Woodall and Dr. David Buller on a research project entitled “Web App Technology for Boys and Parents: Improving HPV Vaccine Uptake.” Other collaborating investigators include Dr. Alberta Kong and Dr. Randall Starling from the University of New Mexico. The four-year HPV project, funded by a grant from the National Cancer Institute (CA210125; G. Woodall, PI), is designed to produce a mobile web app to accurately inform parents and adolescent boys about the HPV vaccination and address unique concerns about its safety and effectiveness for boys. The mobile web app is being developed for personal computers, smartphones, and tablet computers. Dr. Zimet’s research also has involved randomized clinical trials designed to evaluate the effects of brief health communication messages on hepatitis B virus and HPV vaccine uptake, and on acceptance of HIV testing. Through his involvement over the past five years in the Adolescent Medicine Trials Network for HIV/AIDS Interventions, Dr. Zimet has expanded his research focus to examine factors related to recruitment of adolescents into biomedical HIV prevention clinical trials. Biomedical trials that may involve the recruitment of adolescents are related to pre-exposure prophylaxis, HIV vaccine, and microbicides. Some of his recent publications address HPV vaccination, microbicide acceptability among adolescents, and attitudes about HIV and herpes simplex virus type 2 testing. 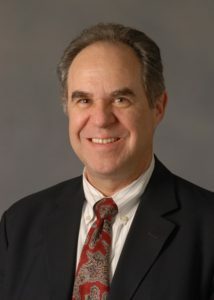 Dr. Zimet has served as a research mentor to five physician fellows, over 20 pre- and post-doctoral fellows in psychology, social work, health behavior, and nursing, and several junior faculty in the Department of Pediatrics and the School of Nursing at Indiana University. Dr. Valerie Myers, Klein Buendel (KB) Senior Scientist, is the Principal Investigator leading a new research project aimed at helping Latinas combat barriers to physical activity using smartphone technology and social networks. Hispanic women are a growing and influential segment of the population, yet health disparities for Latinas remain high. Latinas are more likely than their non-Hispanic White counterparts to be overweight, diagnosed with diabetes, and physically inactive. Regular physical activity promotes physical and emotional well-being, such as lower risk of heart disease and diabetes, weight management, and improved quality of life, yet physical activity interventions for Latinas remain limited. Community-focused walking interventions produce improvements in physical activity and are well-received by Latinas when they are socioculturally sensitive. New technology has the ability to provide Latinas with innovative ways to connect socially and increase PA. Location-based services (LBS) are a popular technology that uses geographical positioning to allow individuals to use their smartphones to connect to their surrounding environment. ¡Caminemos Juntas! is a physical activity walking app that uses location-based services to connect Latinas within nearby neighborhoods as a way to provide social support for increased walking behavior. A prototype of the ¡Caminemos Juntas! app was programmed for both iOS and Android smartphones in a previous Phase I project. Multi-method formative research was conducted to guide app design and content prior to conducting field usability testing. To guide prototype development, a national sample of Latinas (n=98; mean age 32.7 +/- 7.8 years; 45% primary Spanish speaking; 28.6% with annual income < $15,000) were surveyed to better understand their preferences, usage, needs, and obstacles of current apps in relation to health and physical activity. Latinas’ current physical activity behaviors and smartphone use, opinions on health-related apps using LBS, how often they access social networking sites on their mobile phone, and their likelihood of using a social networking app to connect to others with intentions to be physically active were also examined. Phase I results revealed that 22.5% never or rarely exercised, 73.5% accessed social networking sites daily with an average of 8 times a day, and 43.9% used LBS every day. Ease of use (82%), informationally accurate (79.2%), and reliability (84.7%) were app features rated as highly important. 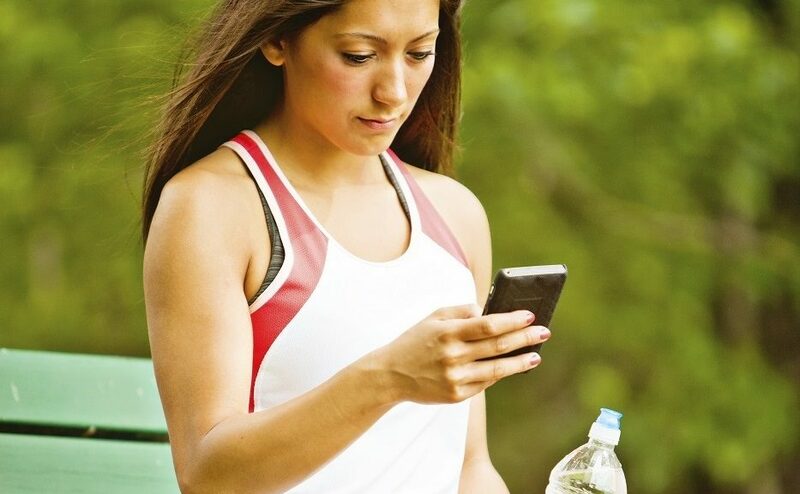 Over 63% reported high likelihood of using a social networking app to connect to others with the intentions of being physically active, and 67.4% reported that this type of app would be very helpful. Focus groups showed that the app was appealing, also. In the new Phase II project, the ¡Caminemos Juntas! app will be fully developed and evaluated in a randomized control trial with Latinas aged 18-45 in San Jose, CA and Denver, CO. Changes in physical activity, social support for exercise, and quality of life will be evaluated. New features to be explored include Fitbit® device integration, mapping of walks, and social media integration. The LBS features of the app will allow Latinas to determine a safe place to meet for a walk, connect with other users nearby, and be notified if there was an available walk in the user’s vicinity. The research is funded by the National Institute on Minority Health and Health Disparities (MD009652) at the National Institutes of Health through the Small Business Innovation Research Program. Dr. Myers’ collaborators include Dr. Abby King from Stanford University, and Dr. Gary Cutter from Pythagorus, Inc. in Alabama. Dr. Barbara Walkosz, a Senior Scientist at Klein Buendel (KB), is one of several authors on a recent publication reporting on Florida pediatricians’ use of AFIX-based strategies for human papillomavirus (HPV) vaccination of adolescents and young adults. The report is published in the journal Preventive Medicine. Research collaborators (coauthors) are from the Moffitt Cancer Center and Research Institute, the University of South Florida College of Medicine, Pediatric Partners, the Indiana University School of Medicine, and the Johns Hopkins University School of Public Health. HPV vaccination is recommended by the U.S. Centers for Disease Control and Prevention (CDC) to significantly reduce the incidence of cervical, vaginal, oral, and other cancers caused by the sexually transmitted virus. A series of vaccinations are recommended for adolescents and young adults, preferably before the onset of sexual activity (9-26 years of age). However, rates of HPV vaccination in Florida and the U.S. are disappointingly low – less than 50% for girls and less than 40% for boys. In an effort to increase HPV vaccination of pediatric patients, the CDC created and implements the AFIX quality improvement program with healthcare providers. AFIX stands for Assessment, Feedback, Incentives, and the exchange of information – the four key strategies of the program which is delivered to clinics by local health departments. The Preventive Medicine paper reports on the results of a cross-sectional survey of a representative sample of 770 pediatric and family medicine physicians in Florida to assess the use of the AFIX strategies. Less than half of the physicians surveyed reported implementing any AFIX strategies, leaving room for program engagement, uptake, and improvement. Klein Buendel (KB) Senior Scientist, Dr. Gill Woodall, is the Principal Investigator leading a new research project aimed at reducing intoxicated driving by people with court-ordered ignition interlock devices (IIDs) through improved communication and support from family members. Driving while intoxicated (DWI) remains a substantial and preventable source of morbidity and mortality in the U.S. The IID, which requires a driver to blow into a breathalyzer unit installed in an automobile to establish sobriety, reduces drunk driving while installed. However, research has shown that once IIDs are removed from DWI offenders’ cars, DWI recidivism levels return to those comparable to offenders who did not have an IID installed. This new project will fully develop and evaluate B-SMART — smartphone technology to teach coping skills, communication skills, and strategies to help deter DWI. Unique to this intervention are the involvement of family members in supporting the DWI offender to not drink and drive, English and Spanish language options, and the use of smartphone technology to make that support immediate, accessible, and diffusible. The core content of the intervention is based on empirically-validated couples therapy curriculum developed by Dr. Barbara McCrady from the University of New Mexico. It will be adapted for concerned DWI offender family members and delivered through a convenient smartphone web app platform. Programming and usability testing will be done by KB designers and developers. Results of a Phase I feasibility study of an initial module of B-SMART presented at the Research Society on Alcoholism by Dr. Woodall in 2016, showed very positive reactions by users. Thirty-two concerned family members of DWI offenders browsed the communication skills module of B-SMART and then rated the module on the System Usability Scale (SUS – Bangor, et al., 2011). Results indicated an average SUS rating of 44.2 (sd=4.78, scale range: 10-50), with 87% of participants rating the B-SMART module 40 or above. These results indicate that users found the prototype B-SMART module easy to use, informative, and very positive. For the new Phase II evaluation, a randomized efficacy trial will be conducted with DWI offenders and their concerned family members recruited through the New Mexico court system. The research is funded by the National Institute on Alcohol Abuse and Alcoholism (R44AA022850) through the Small Business Innovation Research Program. Dr. Woodall’s scientific collaborators include Ms. Julia Berteletti from KB, Dr. Barbara McCrady and Dr. Vern Westerberg from the University of New Mexico, and Dr. Gary Cutter from Pythagorus, Inc. in Alabama.